I should have posted this a few days back but I couldn't find the other pictures I've taken a month ago. Anyhow, I'll have to make do with this sliver of Leche Flan to illustrate the point. 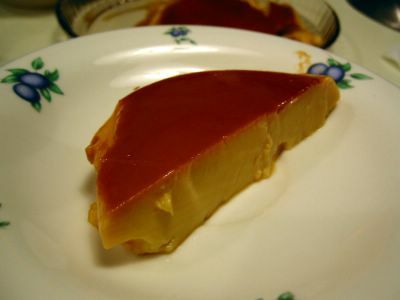 Leche Flan is a Spanish legacy to the Philippines. It's very similar to the Creme Caramel except that we generally use canned milk rather than fresh. I say 'generally' since there are lucky people who has access to cow's or carabao's (water buffallo) milk and use that which results in a very creamy distinctly flavoured confection. Unlike us, who still have to find a farmer-relative whose carabao is currently lactating. :( As such, the rest of the Filipino household is relegated to evaporated and condensed milk. Though I think they're not entirely inferior, they in fact impart a nutty taste to dishes. And of course they're a more practical choice due to the high incidence of dairy spoilage because of the heat in the Phils. We usually make this every annual fiesta in our barrio. Whenever I see and/or eat leche flan, the memory that comes to mind is 'fiesta'. We'd make dozens of these and serve them with sweetened macapuno and ube. Sometimes I'd help my aunt to caramelise the sugar which we do directly in the 'llanera' (molds) by heating the sugar right in there. So the llanera has to be metal and usually oval in shape. I know it's probably easier to do it by melting/cooking the sugar caramel all in one batch then pouring it onto each mold. But my aunt, who's either masochistic or just following tradition, still do it in each and every llanera. My challenge when I wanted to make this here is to search for metal molds. Solid baking pans should be alright but they additionally has to withstand direct heat, i.e., heated up on the cooking hob. As for the custard itself, it can be of any permutation of the ratio of egg, milk, and sugar. Some use the whole egg, while we always use just the egg yolks. I've also never tried to bake this in a bain marie (water bath) which will work perfectly. Steaming is our preferred traditional method for this, making sure the llaneras are sealed well with foil or paper (my aunt just use plain bond paper) on top and tied with a string or rubber band on the side. If moisture from the steam comes in, it will make the caramel a bit watery. It's still okay but not as appetising as a well sealed one. Mix the egg yolks, milks, and flavouring gently. Do not whisk, you do not want bubbles in it so it will result in a smooth set custard. Strain the mixture while pouring it into the metal molds with caramelised sugar. Cover tightly with foil, parchment paper, or plain paper. Secure by tying a string or rubber band in its circumference. Steam in medium-low heat for 1 hour. Remove from steamer and cool completely. To serve, run a knife around the edge and invert into a serving plate. *Note: I have done this with 10 egg yolks only and it is as good as one with 12 egg yolks. What will happen if it was steamed for a shorter time? longer time? How's the consistency if more eggs were used? Shorter time? Undercooked and softer than usual. I haven't steamed it longer than before but I did bake it in a baine marie longer than usual and as expected was overcooked. More eggs means a richer taste. Hello Anonymous, when you steam it make sure that the water is only simmering so lower the heat of the cooker. It happened to me before where I had the heat on medium and the water was definitely on boil and had lots of steam but the leche flan came out with lots of bubbles. I almost always use a steamer for my leche flan. I still have yet to master the baine marie method for this. I know that this is an old post, but I would just like to clarify if shorter steaming time means softer Leche Flan? I tried to make a Leche Flan but it turns out to be a little over firm... I do not what's wrong. Does using too much condensed milk also affects the softness or firmness of the Leche Flan? Or is it most probable that I overcooked it? How does an undercooked Leche Flan taste like? Thank you! Hello Anonymous, shorter cooking time would make it softer maybe even undercooked. Maybe your flan is firm because of too much heat from the steam? Make sure that once the water boils you turn the heat so that it will only simmer. Too much heat would most likely make it too firm. Remember, custards (like leche flan) needs gentle cooking. Wow leche flan just ate one this afternoon. Although my friend told me that it wasn't a real leche flan at all. She said the texture was different from the real leche flan. She also told me that it was a flan jelly of some sort that is available in the supermarket. 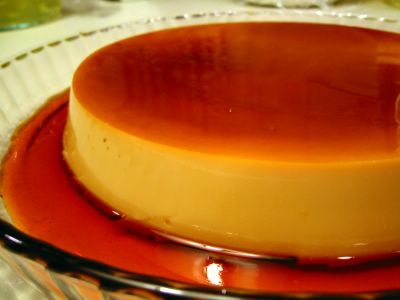 I haven't heard of a flan jelly before but all I know is I really like eating leche flan. I was always mesmerize by how did the brown thing go on top. My mom made a leche flan before but it wasn't as perfect as the picture above. Anyway I'll try to make one myself with the help of your recipe. Thanks!